BEIJING, China, December 31, 2016 (ENS) – China will ban its domestic ivory trade by the end of 2017, the government announced Friday, a new policy conservationists are calling a “game changer” for beleaguered African elephants. “China will gradually stop the processing and sales of ivories for commercial purposes by the end of 2017,” the official Xinhua news agency said Friday, referring to a government statement detailing a timetable for ending the ivory trade. 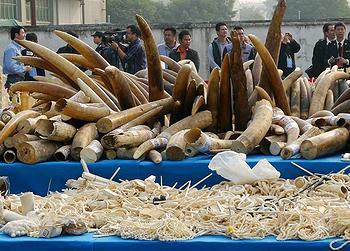 To meet Asia’s demand for ivory, Africa’s elephants are being poached into oblivion. The results of the 2016 Great Elephant Census show African savanna elephant populations are down to 352,271 in 18 countries, a decline of 30 percent in the past seven years. 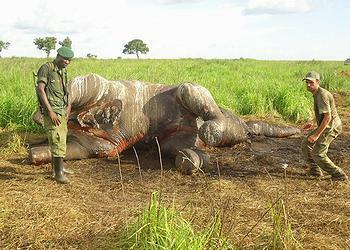 High numbers of elephant carcasses were found even in protected areas. Publication of the timetable arises from a joint commitment that the presidents of China and the United States made during their meeting in Washington in September 2015 to impose near-total ivory bans in their countries. New U.S. federal regulations were enacted on July 6 that prohibit the U.S. domestic ivory trade. 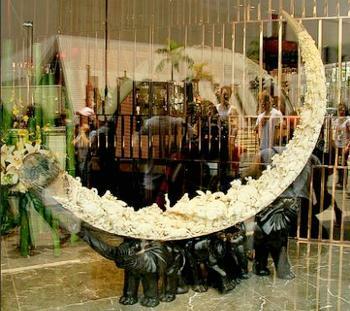 Carved elephant ivory has long been valued as a status symbol in China. At their peak in 2014, prices topped US$2,100 a kilogram, making the country a lucrative market for smugglers of poached ivory. Market inquiries in May 2016 found raw ivory prices had declined to between US$450 and $900, according to the conservationist group WildAid, after China moved toward a partial ban earlier this year. A ban on the domestic ivory trade was first proposed to the National People’s Congress by former NBA basketball star, Yao Ming, who led documentaries on ivory trading for state broadcaster CCTV in partnership with WildAid. The announcement follows China’s move in March this year to widen a ban on imports of all ivory and ivory products acquired before 1975 after pressure to restrict a trade that sees thousands of elephants slaughtered every year. The Convention on International Trade in Endangered Species, CITES, banned the global ivory trade in 1989, after a decade of poaching that killed nearly half the African elephant population, which went from 1.3 million in 1979 to an estimated 609,000 by the late 1980s. After the CITES ban, poaching decreased and ivory prices dropped. But a “one-off” sale of ivory in 2008 and the legal domestic trade in Hong Kong, China, Thailand, Vietnam and the United States have allowed for the laundering of illegal ivory shipments from recently poached elephants. As other countries do, China allows the resale of ivory bought before the CITES ban, and also has a stockpile bought with CITES approval in 2008, which it releases for sale with certification. Conservationists are now asking the Chinese territory of Hong Kong to bring forward a plan to end its ivory trade by 2021. Authorities in Hong Kong announced last week that they would phase out the city’s commercial domestic ivory trade by 2021, although a WWF feasibility study found that it could be done within two years. Conservationists are now shifting their attention to Japan, which voted against all CITES proposals to protect elephants and has insisted its trade is not tainted by illegal ivory. Yet, a recent report by the UK nonprofit Environmental Investigation Agency found that Japan’s elephant tusk registration system allows for poached tusks smuggled from Africa to be sold legally in the domestic market.